Just a short drive (or train ride!) from the DC-Baltimore metro area yet a complete getaway for a weekend or longer, this charming, historic cottage is ideally located in scenic Harpers Ferry with tri-state and river views. Leave the car and walk five minutes to the Harpers Ferry National Historical Park, a treasure trove of pre-Civil War and Civil War history and one of the best-preserved 19th century towns anywhere, complete with living history presentations, museums, interactive exhibits, shops, restaurants, river sports, hiking, biking and much more. Harpers Ferry was the site of abolitionist John Brown's raid in 1859, one of the important triggers of the American Civil War. Visit the John Brown "fort" just a short walk from the cottage. Relax in the rocking chairs on the back porch overlooking the Potomac River and Maryland Heights, or have your morning coffee while sitting on the comfy Adirondack chairs on the huge, secluded front porch. Gaze out over the river gap--the confluence of the Potomac and Shenandoah Rivers--from the sitting area in the spacious, beautifully decorated upstairs bedroom. 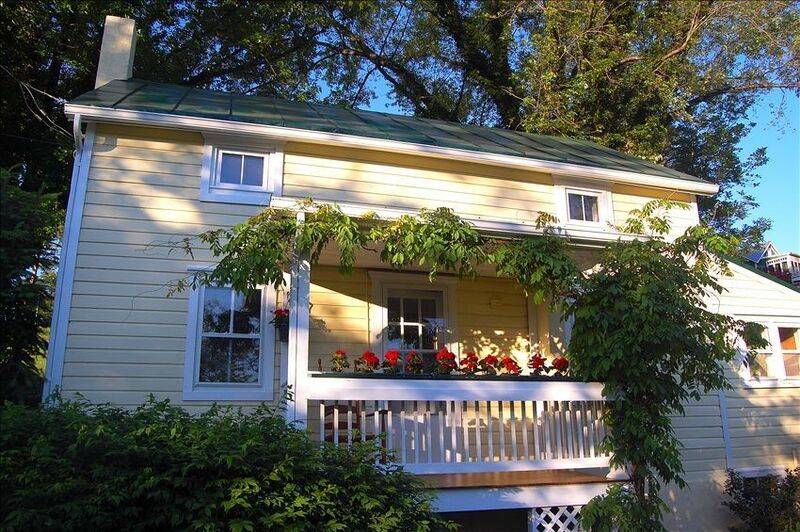 Freshly renovated and painted, this delightful cottage is tastefully appointed and has central A/C and heat, a full kitchen, a cozy and romantic gas fireplace, and intimate proportions that are ideal for a special weekend or week away. Walk to nearby Jefferson Rock, where Thomas Jefferson declared the view "worth a trip across the Atlantic," and hike a little of the Appalachian Trail, which passes just 200 yards from the cottage. Or walk down to the historic lower town and take a dip in the Shenandoah. Cross the footbridge over the Potomac to the Maryland side of the river and you are on the C&O Canal towpath--a 184.5-mile-long national park that offers fabulous biking and hiking. Or try rafting, tubing, kayaking, or canoeing with one of the local outfitters. You will want to explore the gift shops, bookstores, restaurants and ice cream parlors that are part of the Harpers Ferry historical park, or try golfing or wine-tasting at local courses and vineyards. First-class thoroughbred racing is just four miles away at the Charles Town Race Track, and the Summit Point car races are about a 15-minute drive. *Please note: due to the steep, curved stairs in our historic cottage, we do not recommend our property for families with toddlers or persons with limited mobility. Wrought-iron dining set for four, with umbrella. Smaller breakfast set for two. Huge, shady front porch with Adirondack chairs. Back porch with rockers overlooks Potomac River and Maryland Heights. Dine on private, landscaped stone patio. Stay in a piece of history -- cozy cottage is circa 1840 and first floor has original wood floors from salvaged C&O canal boats. Enjoy the charm of yesteryear with all the conveniences of today. Large upstairs bedroom with sitting area and tri-state views of the mountains and river gap. We had a fantastic stay at the Peggy Dye House celebrating a birthday during the first week of April. We spent much of our time enjoying Harpers Ferry and the surrounding area but the time we did spend at the house was very enjoyable. Great location and clean accommodations. We loved staying here. The cottage is exactly as pictured. It's cozy, quiet and very clean. Patricia left great information about the different trails getting into town. We tried them all. Harpers Ferry is a walking town so you definitely want to leave your car and explore. A great town to learn so much history and take in the beautiful rivers and mountains. I will definitely be coming back! Thank you Patricia. The house is small but was adequate for my son and I to stay at during his weekend liberty. There is a beautiful walk to town with incredible views, but it is a lot of steps over some uneven stones from the top of the bluff to where the restaurants and bars are. Not sure the house would be good for an extended stay, but was great for a quick weekend. Neat old house that retains historic feel while incorporating very nice modern updates. Not a huge place by current vacation home standards, but a perfect place for our family of three plus our four-legged friend. Location is even better. Recommended! Our first impression of this home when we saw it was,”oh know the pictures on the website made it look nicer”. But since we had traveled this far check it out. The inside of the home was very clean and neat.It fit the look for the time period it was representing. We do wish they had a television upstairs and the linens in bathroom were very worn. They probably should be replaced. Otherwise we enjoyed our stay and how convenient it was to walk everywhere without taking the car out as parking is limited. We definitely would like to come back someday. Pre-Civil War cottage is perched just above the historic 'lower town' of Harpers Ferry. Five-minute walk (downhill) to historic attractions, shops, restaurants, river sports, C&O towpath, hiking and biking trails, etc. Near historic Storer College buildings which served as generals' headquarters during Civil War. Bolivar Heights Battlefield less than two miles away, and renowned Maryland Heights hike starts just across the Potomac River footbridge. Three-night minimum stay on holiday weekends. Discount! Get seven nights for the price of six! $1,200 for a seven-night stay. PLEASE NOTE that pet fee of $25 is per night, per pet. Dogs must be crated if left alone in the cottage. To help us cover the costs of additional linens, water usage, etc. we have a per-stay fee of $25.00 per person up to 4 persons, for guests more than 2.